We have come across water beads at toddler group and I was fascinated by them. At toddler group Bee didn’t seem too fussed by them as she was busy playing outdoors but I decided to get some to use at home. I have never come across them before but apparently they are used with flowers and have become pretty popular as sensory play with the little ones. There are plenty of ideas online on how to use them, but as it was the first time I was trying them out, I decided to keep it simple. Munchkin was interested in the whole hydrating process as the water beads come very small and you have to soak them for 6-8 hours before you can use them. You have to be careful that these aren’t ingested so if you are using these with young children then please use your judgement as to whether they are suitable for your child. Bee does have a habit of putting things in her mouth but I watched her like a hawk and she didn’t even attempt to eat them and was quite happy using a spoon to transfer them into a pot. Since hydrating these I have discovered that you can actually get edible water beads so that if you are concerned that your child may want to swallow these then they are an alternative option. The girls had fun playing with the beads and feeling their texture. Munchkin just wanted to try to squash them and see what would happen! And even the cat joined in on the fun. 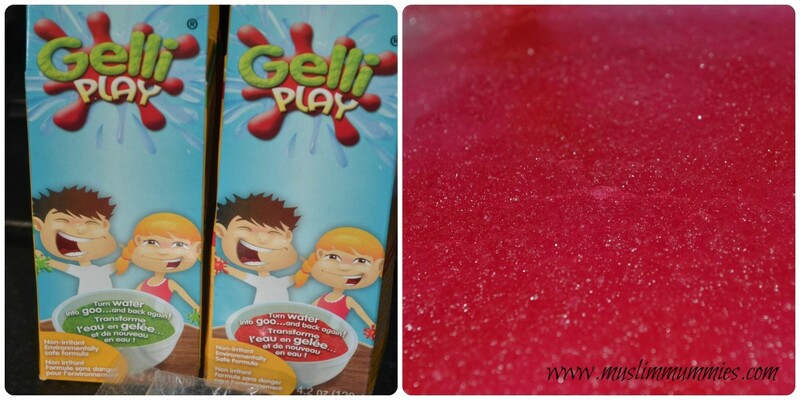 Another great sensory play is with Gelli Play/bath. This is powder that when mixed with water turns into gelli and with another powder turns back into water. Bee was very uncertain about it at first and tried to stop her sister from putting her hands in it! Eventually she couldn’t wait to jump into it and feel it squishing between her toes. Munchkin enjoyed it as much as Bee. They had fun sticking their hands in and feeling it all squishy between their hands and Munchkin put in her zoo animals and covered them all it. The Gelli will be great fun in the summer as I can make it up and leave it in the garden for them to make as much mess as they want! When Bee got bored she had decided to start throwing it about, which isn’t really ideal indoors but it hoovered up OK! The picture of bee trying to stop her sister putting her hand in is so funny! Gellibaff really has a weird texture but then that’s all part of the sensory experience to discover something new! What a cool idea. The gellibaff looks lovely and squidgy. I like this and I am too old to play. Oh I love those little balls…I would like to play with them and I’m very sure my 2 year old would too. I think I would get the edible ones just in case… Great ideas, thank you! I love gel aqua beads (or whatever they’re called!) I’ve used them for use in table centerpieces, but I also quite like playing with them when I’m done haha! Kids would have a blast if I do as an adult!!! 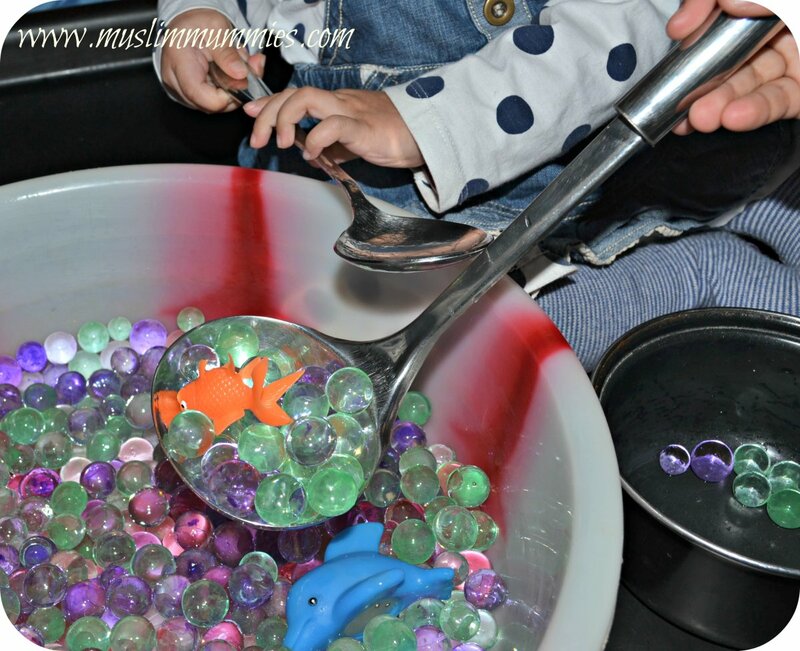 We got some water beads of ebay last summer and my boys loved them- such an unusual texture- and they were amazed at the change after adding water! I keep meaning to get some of the balls to see what my autistic son makes of them! They look like great fun! How nice! Looks like the girls had great fun. 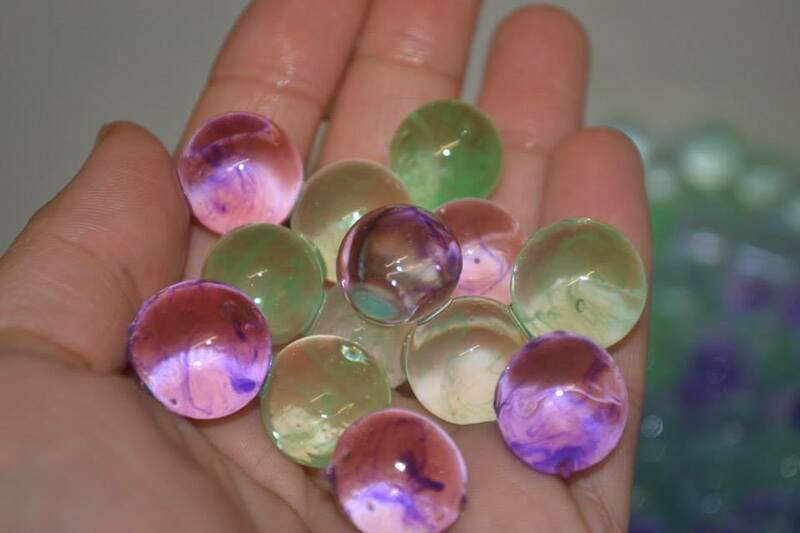 I did know about water beads but it’s definitely something to look into for the summer. It’s funny, my kids (who are OLD (! ), aged 12 and 8) saw these at a craft fair recently and, after touching them, were desperate to buy them! They looked brilliant – obviously good for all ages. 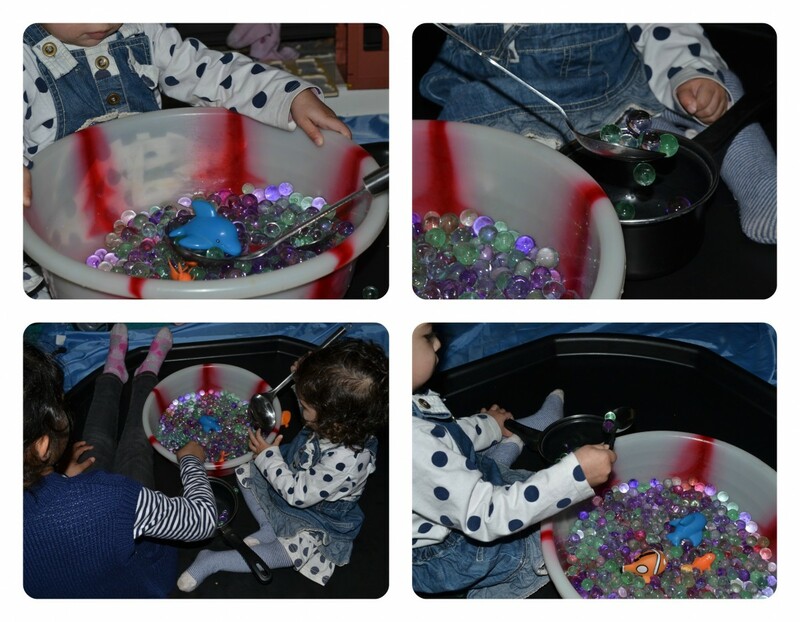 Love water beads, we do lots of sensory activities with them and add them to our small world play. Never tried the jellie stuff though as not seen it anywhere but will have a look on internet as it looks brilliant! 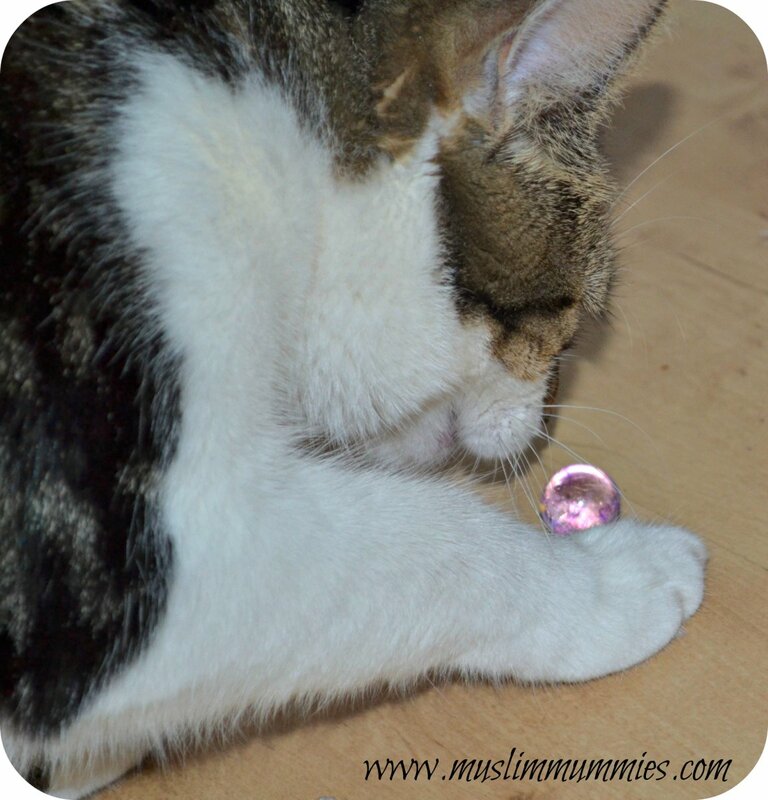 Water beads are next on our list of things to try so it is great to read how you got on with them! I’ve seen water beads before but at the moment the twins would probably eat them! The gellibaff lpoks fab I’m sure they’d love that! These look great! We’ve used the jelly before and the kids loved it 🙂 I shall look out for the beads as my daughter would enjoy playing with them.